Visit city sites and a preserved colonial heritage in a valley with three mighty volcanoes during this 8-hour guided tour. The wonderland of Antigua Guatemala, commonly referred to as just Antigua or la Antigua, is a city in the central highlands of Guatemala famous for its well-preserved Spanish Baroque influenced architecture as well as a number of spectacular ruins of colonial churches. It has been designated a UNESCO World Heritage Site. You will start with a morning Pickup from Guatemala or Antigua Guatemala hotels. At approximatelly 10:30 a.m. will begin our 3 hours soft walking tour of Antigua. 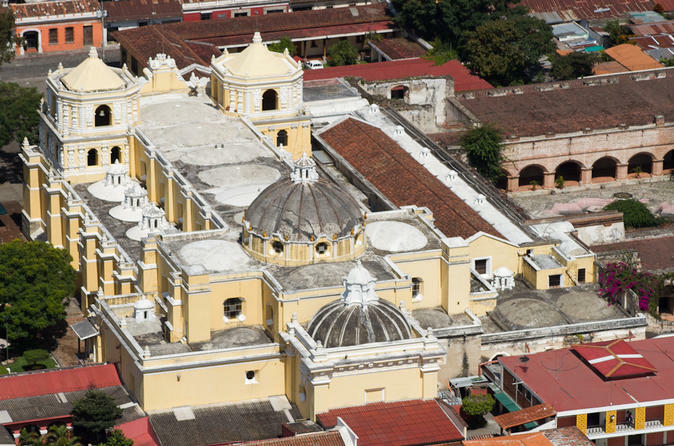 You’ll visit Central Park, Cathedral of San Jose, Arch of Santa Catalina and La Merced Church. Central Park is located at the heart of the city, surrounded by the traditional grid pattern frequently utilized in Spanish urban planning in the colonies. The park is surrounded by the Palace of the Captain Generals, City Hall, the church of San José (formerly the Cathedral of Guatemala), the Archbishop’s Palace and the Portal of Commerce (or the Bakers’ Portal). Here, visitors will also find the Mermaid’s Fountain. The Count of Gomera (Gomera is the word for a rubber plantation) built the fountain in remembrance of a popular legend, which tells the story of a King whose daughters gave birth but did not want to nurse their children. Learn about this famous story as you immerse yourself in the colonial history of the city. Next we continue to visit the villages just outside of Antigua Guatemala. We will visit San Antonio Aguas Calientes, San Miguel Dueñas where you visit a macadamia plantation, and Ciudad Vieja. San Antonio Aguas Calientes, This town is known for its weavers. Mayan women in the area use a backstrap loom to weave traditional patterns. There is a two story market on the square that sells weavings and other crafts. Several of the women have their looms set up and will demonstrate their skills. The tour will return to Guatemala City or your hotel in Antigua at approximately 4:00pm.